I recently started a full-time job. With an hour of commute time each day, I knew my meal prep time was going to be disappearing. So, the week before work began I spent time making some muffins, granola bars, pita breads, and waffles for the freezer. I intended to get a lot more frozen than that, but it was a start. The waffles are delicious and work from freezer to toaster. And this week when I didn't know what I was going to fix for supper, we enjoyed breakfast for dinner. These are gluten-free, whole-grain, and egg-free! 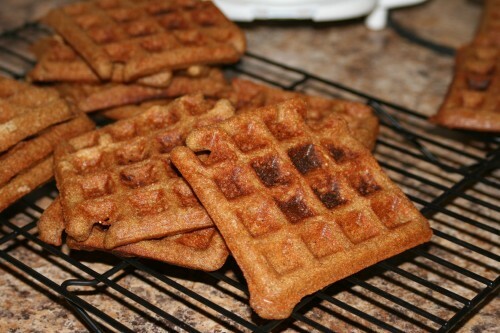 For the waffles, I used a recipe from my go-to cookbook, Nourishing Meals. First make a batch of dry mix (which keeps in the pantry for up to 4 months, so make as many batches you want!). Then make the waffles. I made a triple batch, which made 26 waffles in my rather small waffle maker. Place all ingredients into a large bowl. Using a wire whisk, mix well. Place into an airtight container. Makes 5 cups or 5 batches of waffles. Place the ground flax seeds and hot water into a medium-sized mixing bowl; quickly whisk together until the flax forms a thick gel. Sometimes this doesn't happen right away so keep whisking until the gel forms. Add the applesauce, coconut oil, maple syrup, and milk and whisk together well. Then add the waffle mix. Whisk together until the batter is smooth. Heat waffle maker and cook according to waffle make directions. If you plan to freeze them, cool completely and then layer between pieces of waxed paper and place in freezer bags. I cannot wait to try these. I've been craving waffles lately and these will be JUST the fix I need. Thanks, Steph!